Creamy Ricotta Spinach and Chicken Cannelloni is a classic recipe made easy! Cannelloni pasta tubes are packed with a cheesy ricotta and chicken filling, topped with a creamy and delicious tomato sauce. Simple, super easy to make, and they’re SO tasty! This quick recipe comes together with some fresh spinach, chicken, and ricotta cheese, all topped with an easy creamy sauce. The sauce on its own is half and half, seasonings, and parmesan. The addition of all the cheese makes the flavors pop even more. The cannelloni tubes are filled with a warm mixture of chicken (try using cooked leftover chicken or rotisserie chicken), cheese, and fresh spinach. The prepared cannelloni are then transferred to a baking dish and arranged over some pasta sauce. Use your favorite pasta sauce, homemade or store-bought. For a finishing touch, the cannelloni are topped with a combination of half and half and cheese, a liquid that the cannelloni will cook in while baking. About 20ish minutes later, dinner is served! The entire recipe should not take longer than 45 minutes from start to finish. The dish is easy to make, kid-friendly and makes for some great leftovers. For another easy, family-friendly meal, try my Overnight Slow Cooker Breakfast Casserole — it cooks while you sleep! My Ham and Cheese Pinwheels can be made ahead and are easily packed into lunchboxes. Homemade meals have health benefits you may not be aware of — simple recipes help make it easier to ensure everyone is eating healthy meals. Preheat oven to 400°F. Heat oil in a large skillet over medium-high heat. Add onions and sauté for 2 minutes; stir in garlic and chicken and continue to cook for 4 minutes. Add milk and simmer for 2 minutes, or until most of the liquid has evaporated. Stir in ricotta cheese until well blended. Add spinach and cook for 2 minutes, or until wilted. Remove from heat and let stand a few minutes, or until cool enough to handle. Spoon pasta sauce on the bottom of a 9x13" baking dish and set aside. Using a spoon, your hands, or even a piping bag, stuff the prepared chicken mixture into cannelloni tubes. 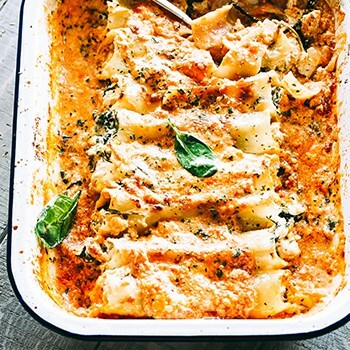 Arrange the cannelloni in a single layer on the bottom of the previously prepared baking dish. Set aside. In a mixing bowl, combine half and half, parmesan, basil, oregano, nutmeg, salt, and pepper; whisk until thoroughly combined. Pour the half & half mixture over the cannelloni. Bake in the oven for 18 to 20 minutes, or until top is golden brown and the cream is reduced. Remove from oven and let stand 3 minutes, or until sauce has slightly thickened. Spoon the sauce over the cannelloni and serve. My name is Katerina, and I am a cookie-maker, baker-faker, food-taker. Errr! I mean, picture-taker! I'm also a Recipe Developer, Food Photographer & Author of the delicious food blog Diethood, where I share easy dinner recipes, sides, appetizers, desserts and drinks! The word “diet” in "Diethood" refers to the sum of the food consumed by yours truly, and my family.